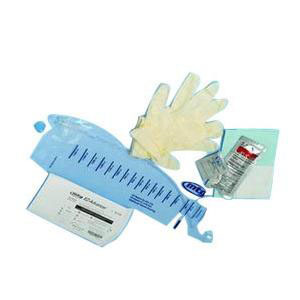 The intermittent closed system kit consists 16Fr coude pre-lubricated sterile vinyl intermittent catheter, Contains 2 vinyl gloves, 1 underpad, 1 gauze, 1 BZK wipe and self contained 1500mL collection bag. Soft, silicone, introducer tip Reduces UTI . Firm or soft vinyl tube.